Much has been said about hometown tourists, where locals go and explore their hometown like a visiting tourist rather than like a local. A local might take his/her hometown for granted, choosing instead to travel far and wide for a holiday or getaway instead of going on a staycation and explore his/her own hometown. Why? Because the hometown would always be there, and the locals can explore it anytime, although in the end, they never really do anything about it. Because it’s still going to be there, right in their own backyard. Talking about hometown tourist, I recently became one, although not exactly in my own hometown but in the town near to where I currently live. The trip was with Tourism Selangor for their second #TSDayOut Special Edition. It was a trip to Klang, the royal town of the state of Selangor in Malaysia, and where the state tourism body had recently introduced a free 2.5-hour walking tour called Royal Klang Town Heritage Walk. So on that fine Saturday morning whist on the bus from Shah Alam, the state capital, I thought we (the bloggers and media representatives) would be following the trail with a tour guide at hand to explain this and that. But wait, what was I thinking though? Easy life of a tourist on a group holiday? Dream on, ha ha! The folks at Tourism Selangor however had a different idea for the trip, as they had turned it into an Amazing Race competition of some sort. The group was split into teams of two and we were all given 25 questions to solve within 4 hours, through a combination of photo submission, written answers and a couple of items (which we needed to buy) based on what we find during the “race” around the royal town. My initial thought was that, okay, this should be fine. I had first visited Klang, coincidentally also with Tourism Selangor during one of its #TSDayOut events a few years back and repeated the visit with them again during their My Selangor Story competition back in 2013. I have also done the heritage trail (or rather, part of it) with at least a couple of travel bloggers from outside Malaysia who were in town for a visit, playing tourist guide for them. So yeah, those visits and the times I played tourist guides should come in handy. Upon getting the questions, I however began to realise that they’re not that easy. My teammate and fellow blogger, Norfanil and I sat for a bit in the compound of the Royal Gallery, reading and analysing the questions, some of which were quite tricky. We probably got almost 2/3 of them before we set off to wander around the town to take some photos as answers. The rest of the questions however left us wondering and wandering (probably not unlike a couple of headless chicken, heh!). Despite having visited the town and even to the extent of playing a guide to others, I still haven’t covered much of the town. I’d never visited Istana Alam Shah, the Royal Palace. I’d never seen the Keris statue before that day. And even in historic places that I had been to prior to the day, I still had missed some interesting info and anecdotes. For example, I didn’t know there’s this safe in the local Fire Station which cannot be opened, leaving everyone wondering what’s inside because the key is lost forever. I also didn’t know or rather, didn’t notice the story in the Royal Gallery, about a 22-feet long crocodile which was caught in Klang River some 3 months after the coronation of the state sultan (the late father of the current sultan) and how it’s supposedly related to the Daulat (sacred power or divine right) of the then Sultan. These are the stories and anecdotes that make a tour or a visit to any place more interesting. And yet, I had totally missed them, and probably would still haven’t heard of them if I hadn’t joined this Heritage trail/Amazing race activity with Tourism Selangor. Quite embarrassing, if one thinks about it – especially as the town is located probably less than 15 minutes by train from where I live. Something to chew about, maybe? Needless to say, Norfanil and I didn’t win the “race” but we surely learned a few new interesting things about the royal town of Klang and came away more appreciative of its rich heritage and culture. This is why I believe that everyone – locals included - should take advantage of free walking tours like Royal Klang Town Heritage Walking Tour. Such guided tours give the opportunity to everyone, i.e. not just tourists, to learn about the history of the town and places of interests in a more “hands-on” manner and at a leisurely pace, compared to learning it by reading a book or in a classroom. There is obviously nothing wrong with going on a holiday to some place far and exotic but at the same time, we shouldn’t take for granted about our own hometown. So yes, go on, become a hometown tourist for a day or two, and see how you might come away more appreciative of the place you call home, and what it has to offer. 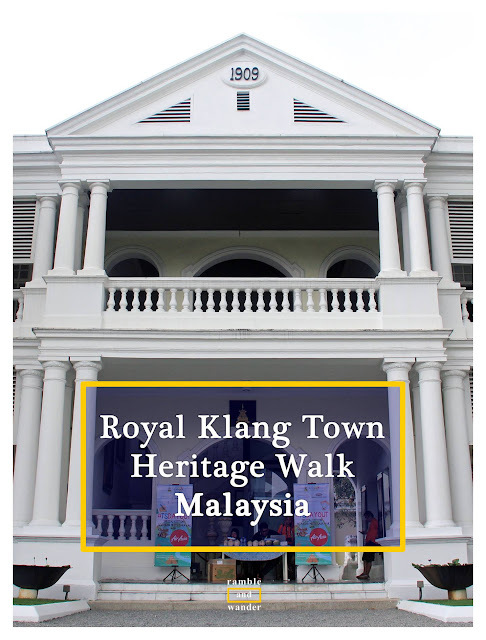 And if you live around Klang Valley or are visiting Kuala Lumpur, don't forget to join Royal Klang Town Heritage Walking Tour. It'd be a good 1/2-day trip out of Kuala Lumpur. A bridge to better understanding & appreciation, perhaps? Have you ever played tourist in your own hometown? What struck you most when you did that? If you haven’t, what’s stopping you? Royal Klang Town Heritage Walk is a joint initiative by the Klang Municipal Council and Tourism Selangor. The walk covers more than 9 historic sites in the oldest part of the royal town and is conducted every Saturday at 9.15 a.m. starting from Royal Gallery Sultan Abdul Aziz. It is free and open to all. Pre-registration however is required via Tourism Selangor website. I would like to thank the organiser of #TSDayOut Special Edition Selangor Meets Sarawak, Tourism Selangor, for the opportunity to be part of the programme. 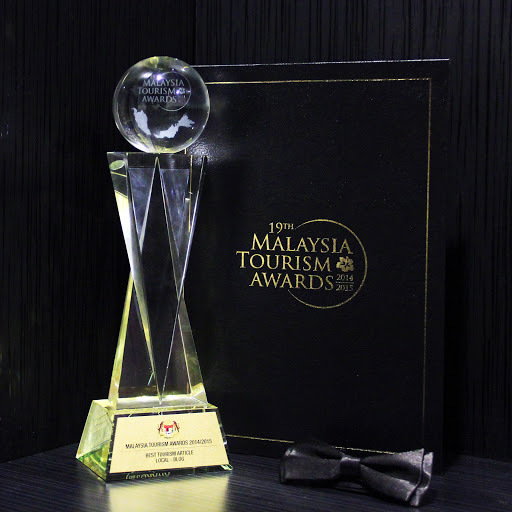 A big thank you also goes to other official sponsors, which include Sarawak Tourism Board, AirAsia and Empire Hotel Subang. #TSDayOut is a Tourism Selangor programme that introduces and promotes interesting places as a day out/day trip destinations in the state of Selangor in Malaysia. The programme is opened to bloggers, media practitioners, and social media influencers. #TSDayOut Special Edition programme combines a trip in Selangor and a visit to another destination outside of the state. For this second #TSDayOut Special Edition, the destination is Kuching, Sarawak. For more information about #TSDayOut, check their website here. For other blog entries on #TSDayOut Special Edition, click here. Going to Klang, Selangor? Do check out these hotels for your accommodation requirements there. I like the idea of a "race" for a tourism tour. It something different and you actually have to think about the history a little bit instead of only half-heartedly listening to a guide. Yes! I loved it although there's some frustration somewhere in there too, especially when we couldn't work out the answers! Haha! The winning team answered 24 questions (out of 25) correctly, which was like too much! Haha! Yup! I think it's a great idea. Surely put us on our feet to explore the town on our own whilst giving us some clues to keep us on the right track! You will need to write for our series, Outside my Front Door, where travel writers share exactly what you have shared with us, what is outside of their own front door. That would be a pleasure! I thrive on discovering secret or little-known stories of destinations we visit like your stories of the keyless safe and crocodile. How fun for you! It was quite fun and an eye-opening experience too actually. Using the race as the tour was a great idea. So much to do in your own country, you will be surprised. Yes, I used to think there isn't really much to see and do around here but after exploring the country more these past few years, I sure have changed my mind! I agree that we often fail to venture into our own backyard or nearby neighborhoods. I'm guilty of that myself! I'm glad you took the time to do this tour - seems like it was such a unique experience! It was, and doing it with new and old friends made it even more memorable. Perfect post! I think we often take our hometowns for granted and think we have all the time in the world to see it, but in reality people from the other side of the world who only visited for 4 daysd probably know it better than we do! I've started to realize the benefit in being a hometown tourist, and I've been genuinely surprised by what I've found. Highly recommend this - thanks for the great post! I love the idea of a trivia game while sightseeing around your local digs! There are still plenty of things I don't know about the area where I lived for around twenty years now, and would love to learn more. The Royal Klang tour sounds like a lot of fun! I love trivia & treasure hunts and the likes, but not when I'm losing, haha! It's a good idea though, makes you think and be more alert about stories, history, anecdotes and stuff, more than if you're on a walking tour with a guide, in my opinion. I love the idea of the race theme! What fun! And you are so right. Even after living in the DC area for more than 20 years, I notice something different every time I explore. I loved the race but not when I'm losing ;) It was still fun though, and like I mentioned above, quite an eye opening experience too. Made me want to explore it further and deeper too! Hometown tourist eh? Seriously nak pecah kepala to solve the pantun and riddles. More like being teased and bullied voluntarily. Anyway i didn't realize about the lost key forever story till u wrote about it. Hahaha! Kan? I didn't know about the safe+key too, only found out about it when Renu was showing the answers during dinner in Kuching. I thought the answer to the locked question is Gedung Raja Abdullah because the gate has been closed/locked since like forever, even when we went there during MSS20013, remember? Hahaha! And I don't think Abg Safri (tour guide) mentioned anything about the safe/lock at the fire station too when we did the walk during MSS. Stress gila! Renuga, those who came up with the questions should be subjected to the same torture in the future, hahaha! Or climb Bukit Kutu! Hahaha!